Opinion: Should Manor/Marussia be allowed to return to F1? 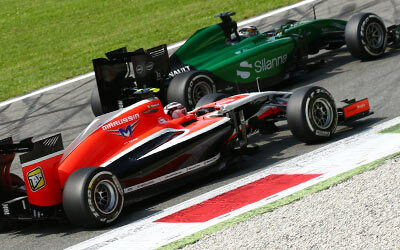 With both Marussia and Caterham going into administration last year, the F1 grid got reduced to a tiny 18 cars race. I personally find that an embarrassment for F1, acting as FIA’s most prestigious formula, yet also fielding almost the lowest car amount among the FIA open wheel series. Even Formula E, FIA’s newest formula, fielded in total 20 cars, while GP2 fielded 26 cars. Only the GP3 series fielded fewer cars as F1 in 2014. Going outside the FIA’s in-house series, Formula Renault 3.5 fields 24 cars, and Indycar fielded anywhere between 20 and 26 cars. These numbers indicate that formula 1 constructor participation has become dangerously low, and boils down to the realization that F1 needs teams like Caterham and Marussia. The former team unfortunately seems to be a lost case, having all of its assets up to auction, with mere weeks from the start of the season. It’s safe to say that that door has been closed for good. Marussia, now Manor, however still has a chance, having left administration and now being under protection from its creditors. Still we have to be careful with too much hoping. The investor remains secretive, possibly because the negotiations are still ongoing. However, let’s not forget a similar attempt with investors at Caterham ended up in a feud with the old owner, which dragged the team completely down the bottomless pit. Let’s summarize some facts and rumours of the last few weeks. On January 5 the team claimed it was informed by the strategy group they needed to comply with the 2015 rules, with exception of Articles 3.7.9, 15.4.3, 15.4.4 and 16.2. This means they’d only need to slightly alter their 2014 car in order to comply. However, the exceptions required unanimous approval from all teams. 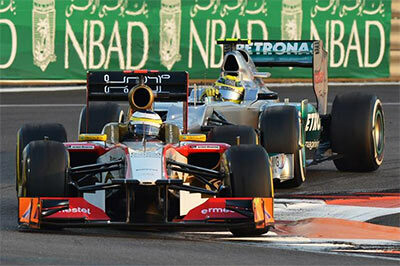 The voting took place on February 5 in Paris, where according to Bernie Ecclestone, "3 or 4 teams" voted against. Only Sahara Force India openly admitted voting against. Deputy Team Principle Fernley claimed it was due concerns of insufficient guarantees of financial backing. Mr. Fernley also admitted that Marussia’s money, 34 million pounds, played a role. If Marussia/Manor misses out on more than 3 races this season, it’ll forfeit its rights on that prize money, at which point it’ll be equally split among the other teams, equalling a bit less than 4 million per team. Manor subsequently issued a statement, claiming they never made an application nor were they asked to provide one, to be allowed to race with their 2014 chassis, stating they only are following what they are being told. They also claimed to be working on an actual 2015 car. A source told me they are setting up a workshop or perhaps even a factory in Bicester. Recent word has it they are working things out with either the old suppliers or with new suppliers (this is not clear at the moment). Marussia has a lot of debt with its old suppliers, rumoured to be 31 million, of which more than 50% to Ferrari. The dropping out of Caterham and turmoil with Marussia also forced the suppliers, which are basically in the same boat, to be paid up front and no longer give credit under reasonable terms. This could further complicate Manor’s return to the grid, as the prize money will only be paid at the moment they are returning to the grid, which can’t happen no later than Bahrain. In the meanwhile they could be strapped for cash. With all that in mind, should Manor return to the grid at all? First off, I’m no supporter of a 2014 car among much faster 2015 cars. The 2012 Abu Dhabi race is a good reminder of that, where the much quicker Mercedes car ran into the an HRT, basically a car with chassis and aero being 2 years behind. It’s outright dangerous. However, the FIA or the teams never made any issues of this. Yes when it got voted a week ago, it did not receive unanimous support. However and ironically, we could assume the reason why had nothing to do with safety, the regulations or even Manor’s solvability. It’s not far fetched that there are teams who rather want to sink Manor and get the 4 million pounds. After all, Fernley openly admitted that it “played a role”. Johnycraig, a member at our boards, also mentioned it could be to deny Ferrari a third customer team, which would yield more data to develop their power unit. This sounds very viable too. F1 is mostly perceived by a sport of self interest, but the difficulties smaller teams have to keep their heads above the water is the main deciding factor for them. Not long ago, Sahara Force India principal Vijay Mallya was calling out for more protection for the smaller teams, however when it’s in their interest that an even smaller team goes down, they are very quick to forget their moral objections. It's not so much criticism as it seems since these teams too are trying to survive, but it does show the hypocrisy when the chips are down on the table. It's not a sport you want to be in when you depend on your competitors. The point I’m getting at is that FIA and the teams, who all have to decide on whether or not Manor can run a chassis not complying with all the 2015 rules, do not have an interest in the least for safety. We can’t blame Manor for trying and vouching for temporarily fielding their 2014 car, but they should have really gotten the 'No' on January 5, rather than keeping the door open before allowing the teams to decide. But we forgot one further thing that ensures safety, and that should ease a bit of the safety issues, bringing a 2014 car to a 2015 event: the 107% rule. The rule ensures the speed differences do not become dangerously large. If that happens, Manor cannot participate in the race. It is true that Karthikeyan in his accident with Rosberg managed to slip through the 107% rule, and have his quite harsh accident which luckily did not end with somebody hurt, but it at least limits the risk to a certain extent. They’d still be fulfilling their contractual obligations by attending the race, and in the meanwhile they can work in all earnest on their 2015 car. So what options are there for Manor? It is difficult, their survival will most likely depend on the 34 million they’d receive if they show up in time. A 2015 car will never get finished in time now for Bahrain, but it might be possible to adapt the 2014 car to comply with all the 2015 regulations. This will depend if the suppliers are willingly to deliver to a team that has huge liquidity issues.